For the last few years, Ken Block has been destroying the tires on Fords like it was his job. And that's pretty much because it is his job. Now Kenneth Blockington III Esquire has helped modify a Focus ST for road use. It looks pretty damn fantasmic. Yes. Fantasmic. Dubbed the Focus TrackSTer (GET IT? TRACK and ST? ), the car is meant to combine on-road dynamic with on-track awesomeness. 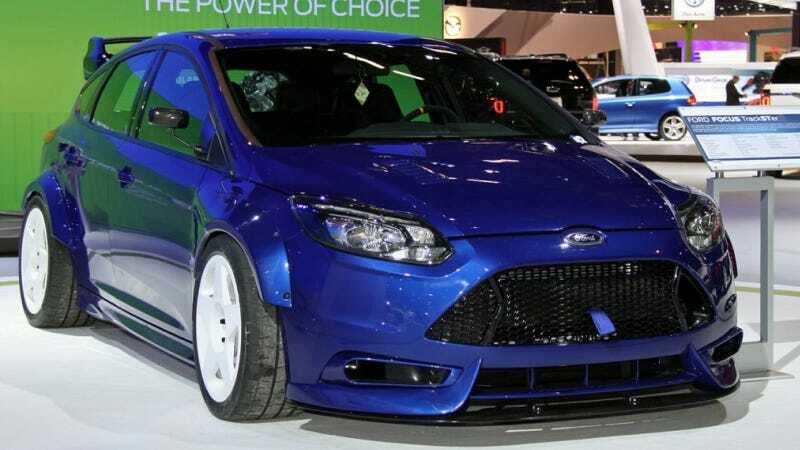 The goal of the project, which was built in conjunction with fifteen52 and Ken Block, is to double the output of the Focus ST. That means it's supposed to have 504 horsepower. It appears that all of that power will be going straight to the front wheels, which there are just two of. Holy possibility of torque steer Batman! The TrackSTer also gets a variable suspension, fade-free brakes, fenders from the Focus Chinese Touring Car racer (the best part of the car, methinks), huge wheels, and a delightful shade of blue paint. The result is the hot hatch of my dreams. And I certainly prefer it to Shelby's Focus ST that was shown at the Detroit Auto Show. This thing is in a different league. Shelby Ford Focus ST: Where Is The Tire-Murdering Horsepower? When will it go on sale? Probably never. How much will it cost? I assume many, many American dollars. But that doesn't matter, since it won't be built anyway.